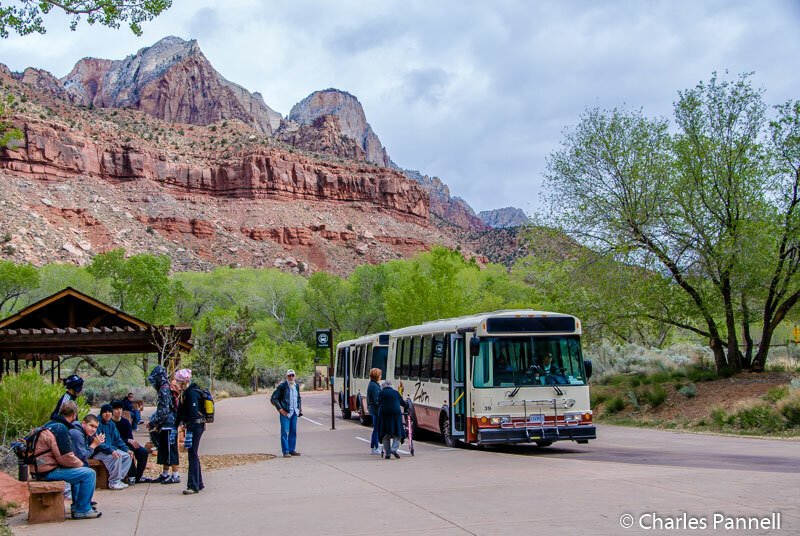 Since vehicle traffic is restricted in Zion National Park, most visitors are well aware that they’ll have to hop aboard the free shuttle for transportation to the major overlooks and trailheads in Zion Canyon. And although the shuttle bus drivers do a good job giving visitors the lay of the land, many folks are completely unaware of the great ranger-led tours that also run on the shuttle route. Conducted daily during the summer months, these two-hour tours start at the Zion Canyon Visitors Center. Advance reservations must be made for these very popular tours, as seats are extremely limited. Reservations may only be made in person — up to three days in advance — at the information desk at the Zion Visitors Center. Telephone reservations are not accepted, so the whole process requires a little planning. But it’s well worth it, as the park rangers offer visitors a multitude of in-depth information on the geology and natural history of the park. All of the Zion Canyon shuttle-buses are lift equipped; however it’s best to note your access needs when making a reservation. Make sure and book as early as possible though, as the accessible seats tend to sell-out quickly on this must-do Zion tour.